Photos show unit variations and the flex shafts that supply the rotary power transmission, when in use. Rome, Georgia – Suhner Industrial Products, LLC introduces the TurboTrim – a complete unit for cutting and trimming beef, pork and poultry. The unit has multiple sized trimmers available for use in the different steps of the meat cutting process, helping to increase productivity, performance and product yield. Features of the unit include high-quality, long-lasting stainless steel blades which require fewer sharpenings, a coated housing which runs smoothly and quietly with minimal vibration and a patented, adjustment free housing with fewer moving parts to save time. The TurboTrim has a hard plastic handle which is ergonomically designed for operator comfort and a lightweight handpiece to enhance operator performance and reduce fatigue. TurboTrim knives are based on the principle of a rotating round knife, and manufactured with the highest Swiss quality and precision. The TurboTrim has a stainless steel motor assembly featuring a slide out bracket which allows motor to be easily removed for cleanup without the use of tools. Downtime is reduced with a quick change assembly for flexible shaft replacement. Rome, Georgia – Suhner introduces the Rotomax flexible shaft machine, a unique unit with interchangeable hand pieces that allow a user the freedom to perform a wide variety of machining operations with a single machine. The Suhner Rotomax functions as an angle grinder, straight grinder, drum polisher, belt sander, tube polisher or die grinder, simply by changing the hand piece. This new machine has myriad applications in industrial steel fabrication, polishing operations, sheetmetal assembly, food processing and foodservice equipment builds, appliance manufacturing, various stainless steel fabrications including medical and more. The Suhner Rotomax flex shaft power unit allows a variety of machining operations on a single station, with interchangeable hand pieces available to do the job. Ideal for job shop and production line use. The Suhner Rotomax offers users a range of power from 2.0-4.7HP and features electronically-controlled speeds ranging from 500-15,000 RPM in increments of 100 RPM at the touch of a button. The combination of an industrial grade motor and solid-state electronic control ensure constant speed and torque during any application. With no gearing, the Rotomax operates very quietly. 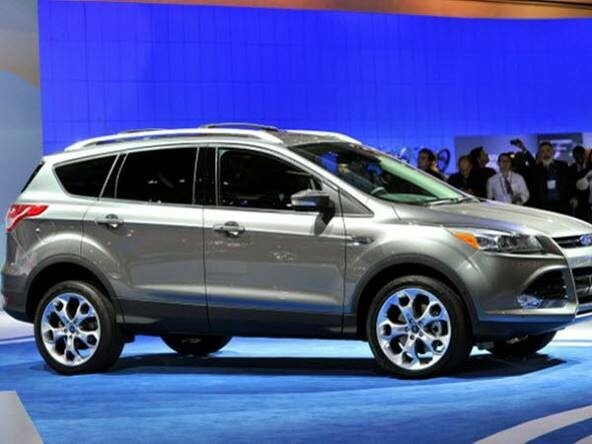 Other features include soft start, integrated braking and an LED-displayed speed gauge. The Rotomax is offered as a hanging model, for the user wishing to keep the power flex shaft above the work; on the basic stand, which can be mounted wherever the user desires; or on a specially-designed stable trolley (STM) for portability around the work shop or production line. Need an easy and quick way to transmit rotary motion from a power source –motor or hand wheel – to where you need the movement? Maybe around a corner? Compensating for some offset? Allowing relative movement between the two components? Reaching into that impossible to reach space? Suhner Standard Flexible Shafts offer a plug and play solution. 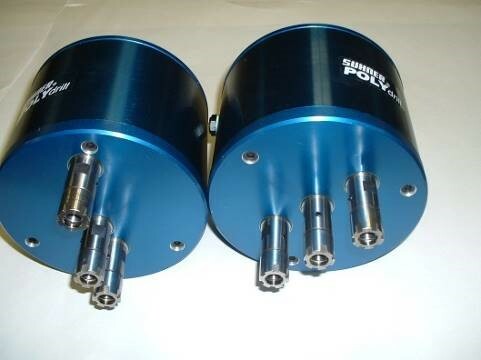 Equipped with standard female couplings with set screws, available for left hand, right hand or bi-directional application in a wide range of lengths and torque ratings, flexible shafts are easy, efficient and virtually maintenance free flexible drive shafts allowing for maximum design freedom in a wide variety of OEM applications in myriad industries. Our K and Ka type plastic casing flex shafts are used throughout the automotive OEM, for engine control and power transmission, as well as interior controls on power seats and steering wheel adjustments. Interested parties can review the online catalog for power transmission products from Suhner and use the handy math tools and other selection guides provided. For more information, please contact SUHNER Mfg., Inc. at info.usa@suhner.com or visit our website at www.suhner.com. Aluminum profiles are produced in all shapes and sizes. Often, these profiles can be very difficult to machine, because of the various shapes, sizes, number of operations required and cycle times needed. When a profile shape will not allow the holes to be punched and cycle time makes producing the parts on machining centers impractical, Suhner, with its modular design and broad assortment of spindle options, can now offer processors an ideal solution to their machining needs. Suhner’s line of spindles for Profile Machining includes the popular MONOmaster Electric Driven, Pneumatic Feed Units, ranging in size from the smallest BEM-3 unit, capable of drilling up to a 3mm hole in mild steel, up to the BEM-28 unit, capable of drilling up to 28mm in mild steel and having 200mm of controlled stroke. Many of the units in the MONOmaster line are available with other options, such as inline, direct drive units for the BEM-6 and 12S, as well as 1:4 speed increasers for the BEM-6 &6D units capable of speeds up to 14,400 RPMs @ 60 Hz. With the larger BEM12 & 12D units, the option of 4:1, or 16:1 gear reduction is available, giving RPM speeds as slow as 40 RPMs @ 60 Hz. Suhner also offers the MULTImaster line of flexible shaft driven units, a feature not currently offered by any other spindle manufacturer. These units are driven by Suhner flexible shafts and are ideal in areas where spacing is a critical concern. The smaller BEW-3 unit allows spacing as close as 48mm center to center. The BEW-6 unit, as close as 55mm center to center and the larger BEW-12 unit, as close as 75mm center to center, are also available. 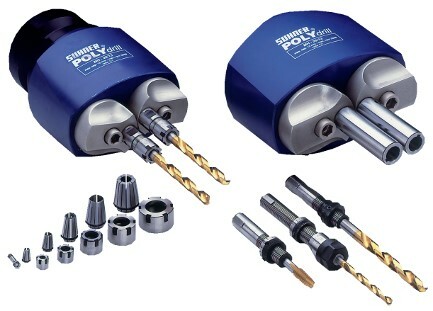 Using these units with Suhner’s VG System, users can drive up to (8) spindles with a single motor. For high precision, tough applications, Suhner offers the POWERmaster line of spindles. This includes the BEX-15 & BEX-35 machining units, capable of running at speeds up to 23,000 RPM’s. These are block units, capable of milling, drilling and sawing operations. Suhner also offers a complete line of slide products to provide the feed movement for the block spindles. These slides are available in pneumatic or ball screw feed design, for either servo or gear motors. Also very popular in the machining of aluminum profiles is Suhner’s line of adjustable and fixed spindle multi-heads for drilling special hole patterns or hole spacing where spindles are too large to fit into the required spacing for the center to center distances needed. Suhner’s line of special fixed spindle multi-heads is built in Rome, Georgia and often can be built to spec in less than six weeks. A typical machine used by a major automotive roof rack manufacturer incorporates many of these Suhner items to produce the long bars for a Ford Escape roof rack. This machine uses Suhner BEW-6 units to drill 6mm holes from the front and back side of the part, where electric spindles will not fit. BEM-12 motorized units, with special fixed spindle multi-heads are being used to produce 8mm diameter holes that are too close for even the smallest spindles to produce, when mounted side by side. 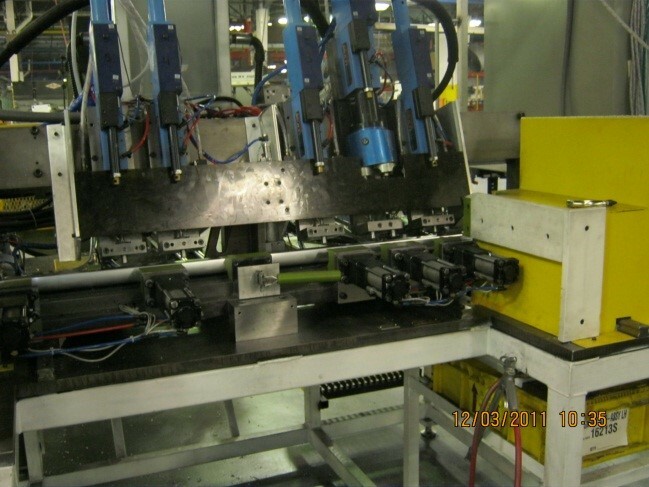 Suhner’s BEX-35 PowerMaster units are used at each end of the part to saw the part to length (Under Yellow Covers). All these operations are ongoing at the same time to produce complete machined parts in seconds, a feat impossible to do on any conventional CNC machining center. With Suhner’s modular spindle design and machining capabilities, most every need of the aluminum profile industry can be met in every market segment, whether automotive, industrial, solar, aerospace, military or commercial aviation. At FABTECH 2015, Suhner will demonstrate its Somex® machining tools, featuring automatic tool clamping and tool release via pneumatic cylinder, designed for heavy-duty sheet and plate cutting to 2“. These tools are typically integrated with laser, plasma and waterjet machines. 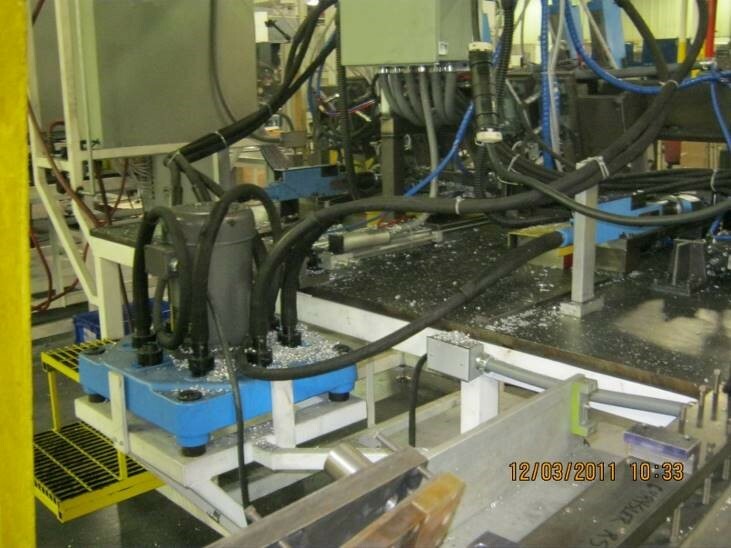 Thru-tool coolant is standard, along with spindle tapers of ISO/CAT 40. These rugged yet precision tools offer spindle concentricity to 0.01mm (0.0004“). Suhner’s Somex machining tools are perfect for heavy-duty sheet and plate cutting. Adapters for servomotor mounting are onboard these Somex® tools, which also feature a timing belt drive system, max. speeds up to 6000 RPM, max. spindle torque to 400 Nm (275 lbs-ft). The tool without the motor weighs 55 kg (121 lbs). Options include HSK63 spindle taper, servomotors to 7.5 HP, spindle position sensors and tool release via hydraulic cylinder. These tools are available with linear ball screw slide assemblies with travel to 480 mm (18.9 in) and thrust of 5500 Nm (1236 lbf). Many other Suhner drilling units for production and OEM machine integration will be on display, as well.